A tough foliage plant with good flowers for a shaded position is always useful. And Arthropodium cirratum has all of these qualities. 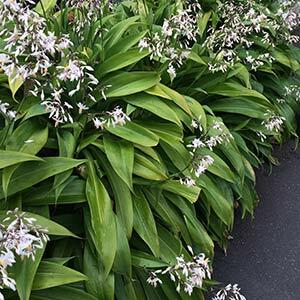 Also known as Renge Renga Lily this is a popular and versatile landscaping plant that performs well in dry shade. In summer the light and airy sprays of white flowers are an added attraction, to the lush broad green foliage. Little care required once established. Annual clean up of old foliage and an application of fertilizer in spring. In very dry long periods in summer a fortnightly watering may be required. Excellent plant for dry shade, growing well beneath deciduous trees and in shaded courtyard situations. Arthropodium cirratum ‘Matapouri Bay’ is the cultivar of choice. Looking for Arthropodium cirratum Wholesale Nurseries, try the following growers.